MINNEAPOLIS — Target Corp. has long prided itself on having a merchandise offering that sets it apart from its peers and has won it the loyalty of millions of American shoppers. 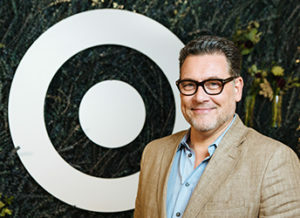 Curating that collection of products, both for Target’s different-sized stores and its digital platforms, is the responsibility of Mark Tritton, and it is one he and his team take very seriously. Tritton is Target’s executive vice president and chief merchandising officer, and a member of its executive leadership team. His responsibilities include overseeing all of Target’s enterprise merchandising, buying, sourcing and product design and development. For his work in helping Target deliver on its “Expect More. Pay Less.” promise with merchandise that is both stylish and affordable, Tritton has been selected by the editors of MMR as one of the publication’s Six Executives Who Made a Difference in 2017. Differentiation is more important than ever in today’s retail environment, Tritton says, and one of the ways Target differentiates its product offering is working with designers and other partners to develop products that are unique and affordable, and often not available for purchase at other stores. And he adds that Target doesn’t take a one-size-fits-all approach, sometimes doing limited-edition collections, and other times doing longer-term partnerships that last for years. Last year Target teamed up with Harry’s, a popular men’s grooming brand that had previously been sold online only. Target began carrying a selection of Harry’s most popular items in an exclusive, limited-edition starter kit in its stores, and also sold its own subscription to Harry’s blades. And next month Target is set to launch Hearth & Hand with Magnolia, an exclusive home and lifestyle brand that Target plans to launch in November. The line was designed in partnership with Chip and Joanna Gaines, the couple behind the Magnolia brand and the stars of the hit HGTV show “Fixer Upper.” The line features more than 300 items in a variety of home categories. The Harry’s and Hearth & Hand by Magnolia partnerships illustrate the way Target identifies unmet consumer needs, and works to address them. Target’s product offering has to be adjusted in a number of different ways, with smaller assortments in some of its urban flex-format stores that have less space, and larger assortments on the Target.com website. With the smaller stores Tritton says the merchandise has to be carefully curated to reflect the needs of the community, while still delivering the Target experience that guests expect. On the website Target can carry additional sizes, colors and items to really complement its brand story or address specific category needs, as in home. But Target is careful not to overdo it, Tritton says. Tritton joined Target in 2016. Before that he was executive vice president and president of Nord­strom Product Group, where he oversaw the merchandising, design, manufacturing, marketing and omnichannel distribution of more than 50 private label brands across Nordstrom’s full-price and off-price retail portfolio. Tritton’s career has included leadership positions at Timberland and at Nike Corp.
What attracted Tritton to Target was the strength of its brand, the team and the fact that it offered a wide variety of products that met a range of customer needs. He said another factor was the team and its sense of purpose, and the fact that Target is investing and moving forward, rather than playing defense.